Almost 70 years to the date of combat in the small town of Tremensuoli, Italy, during World War II, the University of Kentucky’s Louie B. Nunn Center for Oral History along with a researcher in Italy have connected to reveal an amazing discovery about an American GI who served in the battle and left his mark on that community. Several months ago, Giovanni Caruso contacted the Nunn Center at UK Libraries researching a story he wanted to write on a battle in the small town of Tremensuoli in 1944. He had discovered a carving in a stone wall there that identified an American soldier, name and date from hometown and state (M.A. Webb, C-ville, Ky., 1944 March 30). The writer had connected the name to an oral history interview in the Nunn Center’s collection with World War II veterans. The interview, recorded in 1986 by Col. Arthur L. Kelly, was with Marshall Webb of Campbellsville. There was a major battle in Tremensuoli where Webb and his fellow soldiers fought for around three months. In his oral history interview with UK, Webb talks specifically about the battle around the time of the carving and even reads a poem he wrote about the battle. While Webb died in 2004, Doug Boyd, director of the Nunn Center connected with Marshall Webb’s widow Opal, and with the Webb family. In addition to conducting follow-up interviews about Marshall Webb’s life, the family donated to the UK Archives Webb’s photographs as well as papers related to Webb, his life and his service as well as more than 80 poems that he had written about the war. 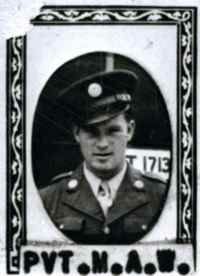 Outside of his combat service in Italy, Webb was part of the unit that first entered the Dachau Concentration Camp in the hours following liberation. Much of his remembrances and collection powerfully document this experience. This story is considered by Boyd to be a great example of the importance of oral history and archives in the digital age. “It is a brilliant example of why we do what we do over here and why these oral histories matter,” Boyd said. To hear the entire four-hour interview with Webb, visit kentuckyoralhistory.org. UK Libraries’ Louie B. Nunn Center for Oral History is internationally recognized for its collection of more than 9,000 oral history interviews. The number of interviews available online continues to grow, providing greater access to the collection. Topics are wide-ranging from veterans’ stories, Appalachia, politics, as well as documenting important Kentucky industries such as the horse, coal and bourbon industries. To learn more about the Louie B. Nunn Center for Oral History, visit the center online here or here.